Top 7 Stories of the NBA Playoffs...and it's Only Round 1! It's only the 1st round and the excitement is already alive and popping in the NBA playoffs. Check out these stories and share some you like from the first of 4 great rounds of hoops. 1. 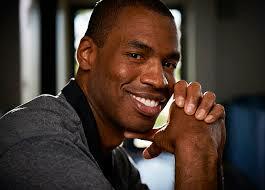 Jason Collins announces he's gay. In our sometimes unfortunate world, this is actually news--someone announcing who they truly are. Although many other athletes have come out as homosexual, Jason is the first to still be active in his sport, of the 4 major professional sports in America. Despite this being his own personal business, we know the realities of our society, so we share in congratulating Jason on his courage and wish him the best. Hopefully more people stand on the right side of social progress. 2. Nate lights up the basket, showing Chicago is Mr. Robinson's Neighborhood. Saturday's game against the Brooklyn Nets was one for the record books. The score was high (totaling to over 250 points) and the energy was a perfect match. 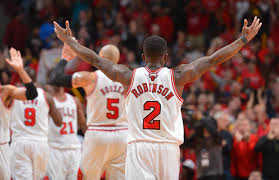 The Bulls' Nate Robinson put on a show leaving onlookers unable to walk away from this triple-overtime game. He had 23 of his 31 points in the 4th quarter when his team overcame a 16-point deficit. In his own words, he was "lighting up the basket like in the old NBA Jams video game". He may have gotten into it with former Bull C.J. Watson, but the efforts and points Nate put up were unmatched in this home win for my home team. He's definitely earned his place in Chicago fans' hearts. We're excited to see more Nate. The series returns to Chicago on Thursday. On both Friday and Sunday, Stephan Curry did his sharpshooting dad, Dell Curry proud by shooting his team into a series lead over the Denver Nuggets. Curry scored 22 of his 31 points in Sunday's game during the 3rd quarter, as the Warriors closed out the Nuggets. Steph was playing through an ankle injury, making his performance even more spectacular. When analysts said a star had been born, Warriors coach Mark Jackson said, "Well, those guys are just coming to the hospital. The baby has been born already. I've been watching it all year long." 4. Kobe Bryant is revitalizing the role of Player/Coach. Like a select few before him, Kobe Bryant has taken on the role of Player/Coach while nursing his injury. Unlike many others, the Player/Coach has not often been the team's leader in every sense of the word. Bryant has high expectations, and a tough work ethic. Although he can't be physically on the court with his team, he's definitely pushing them as hard as possible from the sidelines. See #6 below for more on the saga that is the Lakers' season. 5. Kevin Durant is playing his game, and Russell Westbrook's, too. With Russell Westbrook out like many other favorite point guards, Kevin Durant has taken the Thunder on his back in ways like never before. He exploded for 41 points on Saturday and looked as smooth as ever while adding another win in the series against the Rockets. 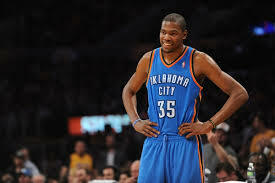 Lucky for the Thunder, their bench is pretty deep, but who can be worried with a star like KD!? 6. Dwight Howard's worth is coming into question. Kobe is out. Nash has been riddled with injuries all season, and near the end of the regular season, Laker legend Magic Johnson challenged Dwight to be the superstar and take the team on his back. At many points during the regular season, it seemed as if the Lakers wouldn't make the playoffs at all. Now, they're here, but conversation continues to loom whether or not D. Howard was worth the money. Should the Lakers let him go? Meanwhile, Carmelo Anthony was called the NBA's most overpaid. Do you agree? He's done everything necessary to put his Knicks up 3-1 over the Boston Celtics--who snuck out a win on Sunday. Is Melo getting too much? Too little? 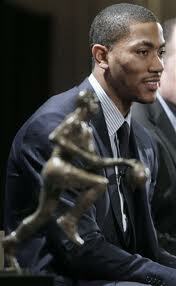 Is this his year? 7. The Superstars we love are missing in action. Get excited for Round 2! B.A.F.F.L.E.D. Green: BOOST Live Event 2013!